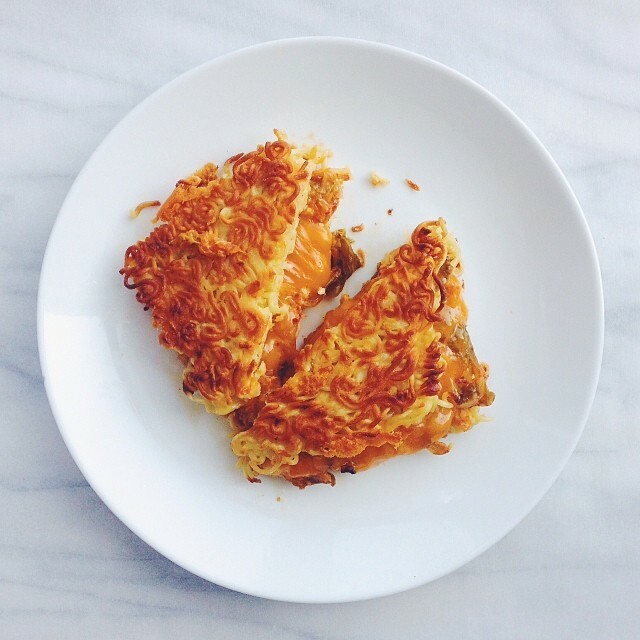 A couple of years ago, I made the original Kimchi Ramen Grilled Cheese, just your regular ol’ grilled cheese sandwich, but with ramen noodles between two slices of bread. Your move. Recently, I heard about the Ramen Burger, a burger with a burger patty between two “buns” made of ramen. Oh, next level, I see. 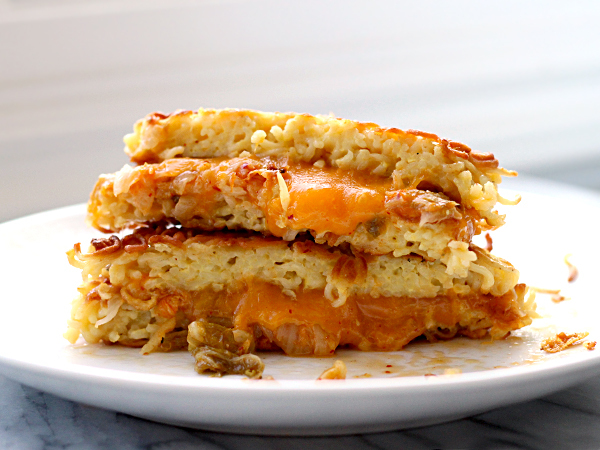 So this week, I made a Ramen Grilled Cheese with Kimchi, a grilled cheese sandwich with parmesan crusted, fried ramen noodles as the bread. Bring a small pot of water to a boil and cook the ramen noodles according to the package directions. Drain ramen noodles, do not rinse, and allow to cool for about 10 minutes. 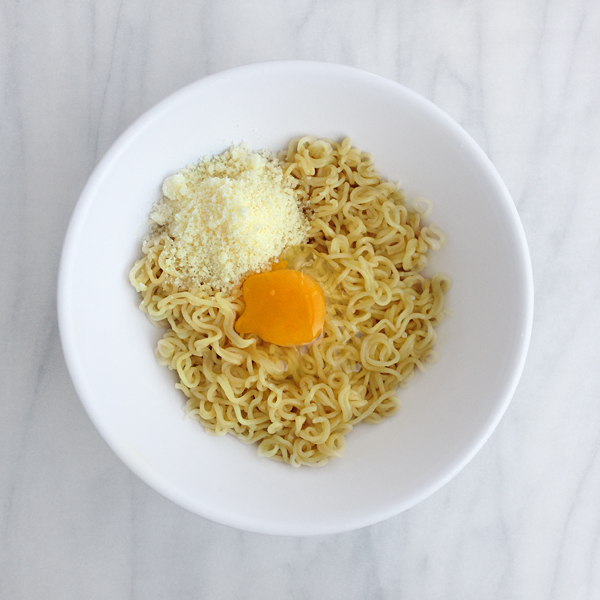 Pour the ramen noodles into a mixing bowl, add egg and parmesan cheese. Stir gently to combine., making sure that the ramen noodles are evenly coated with egg and cheese. 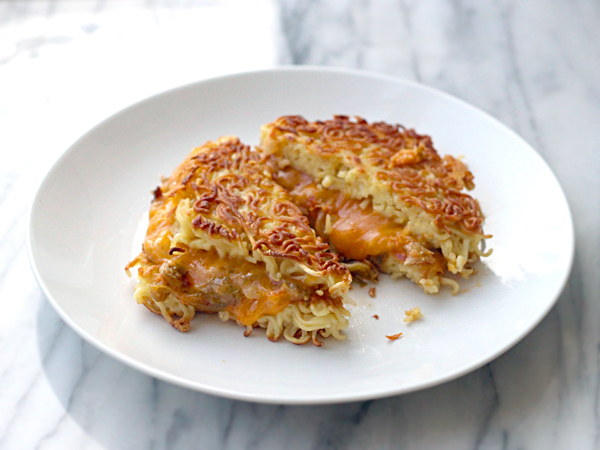 Pour the noodles with the egg and cheese into a loaf pan. Using a spatula or a piece of plastic wrap with your hands, press the noodles down firmly into the bottom of the pan. Cover with plastic wrap and put into refrigerator for about 15 minutes. 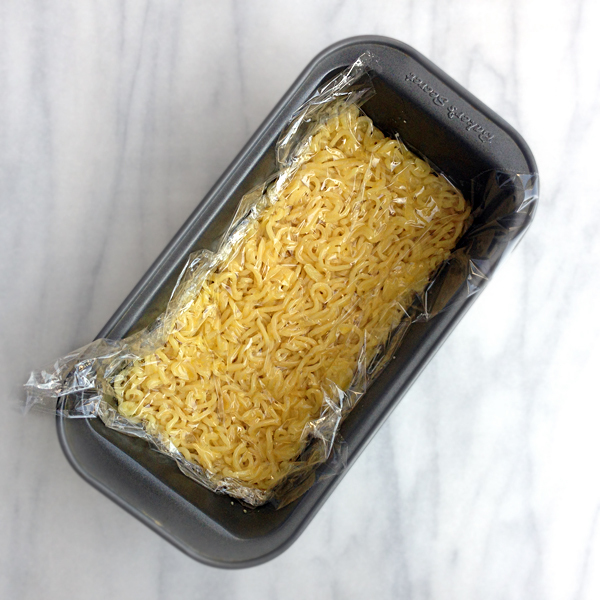 Remove the loaf pan from the refrigerator, remove the plastic wrap, and carefully cut the rectangular ramen noodle “loaf” into two square halves. Leave the noodles in the loaf pan. Heat 2 tablespoons grapeseed oil in a large frying pan over medium high heat. You can also use the equivalent amount of butter, but I use grapeseed oil to keep things healthy. 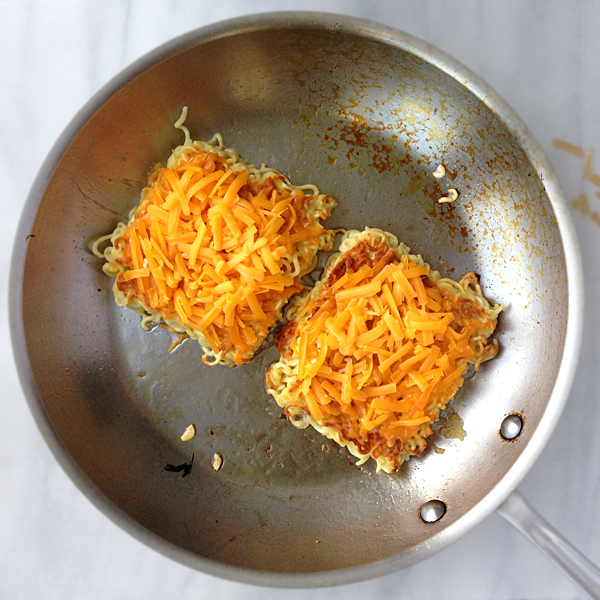 Using a spatula, gently remove each ramen square from the loaf pan and into the frying pan with hot oil. Fry on one side until browned, about three minutes. Using the spatula (and maybe a second spatula to help hold the noodles’ shape), flip each ramen square over. 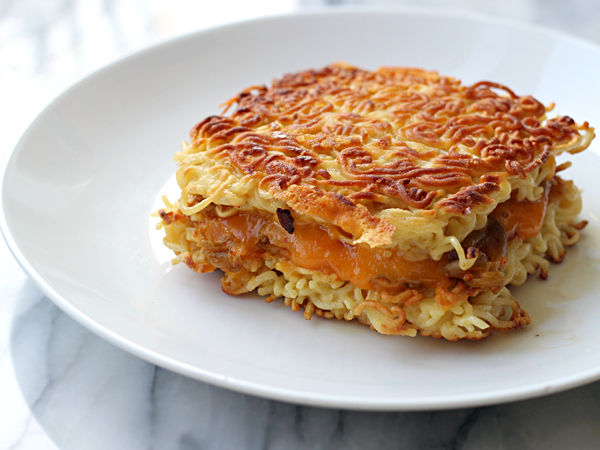 Top the cooked sides of the ramen squares with grated cheese, then chopped kimchi. Fry until the second side of the ramen square is almost browned. “Close” the sandwich in the pan, gently pressing down to “seal” the melted cheeses together. If the cheese hasn’t melted all the way, don’t worry, it will melt on the plate. Remove the sandwich to a plate, cut, and serve. ~ ramen: a Korean brand, Shin Ramyun, Black. 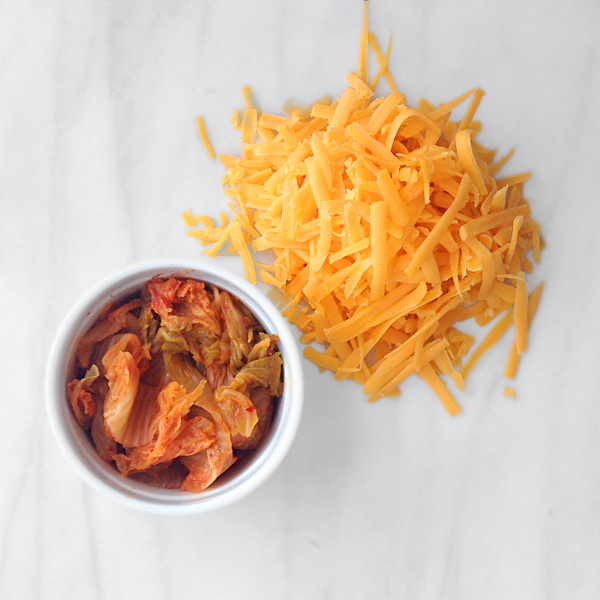 ~ kimchi: any Korean market, though I have seen small jars of kimchi at Whole Foods Market in the refrigerated sections, and even available on amazon!